Da mercoledì 3 aprile 2019 a venerdì 5 aprile 2019International Conference "Designing Sustainability for All"
It is a unique worldwide event, distributed for the first time to 6 venues around the world. The conference will take place simultaneously in Beijing (China), Bangalore (India), Cape Town (South Africa), Mexico City (Mexico), Curitiba (Brazil), and Milan (Italy), and in each of the six venues it will be possible to listen to presentations happening in the other ones. 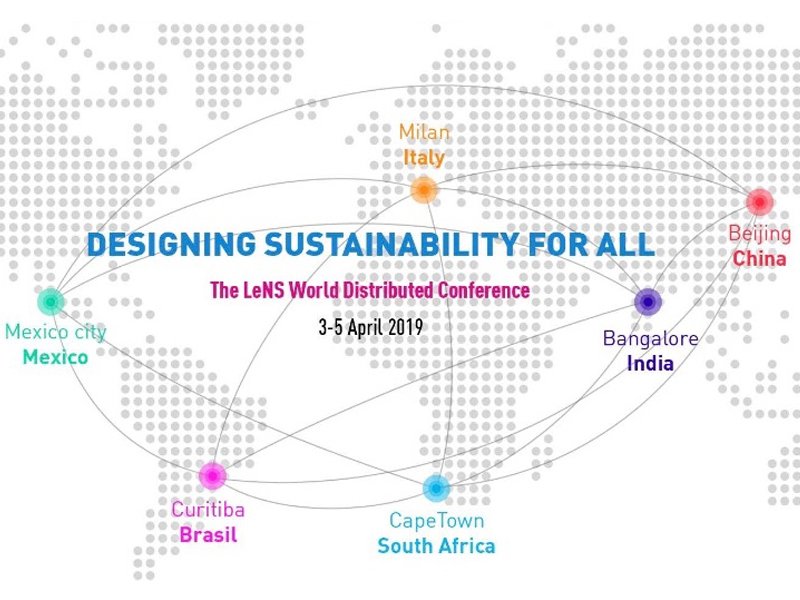 The event organised by LeNS – the Learning Network on Sustainability – is more than a conference. It is a meeting point for those who want to learn and share about design for sustainability with a multicultural, open and copyleft echoes. LeNS vision is to foster a new generation of designers (and design educators and researchers) capable to effectively face the challenge to envision, design and contribute to the transition towards a sustainable world for all. Open access proceedings will be published with full papers of both oral presentations and posters. The conference is free and meals are offered!